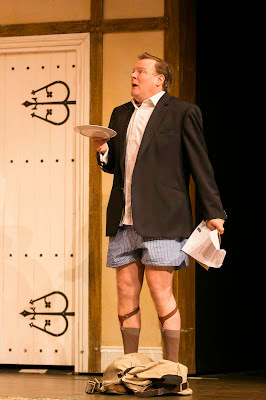 It’s a truth that often escapes audiences yet is almost universally acknowledged by actors/directors and other theatre talent alike that comedy, and in particular comedy of the slapstick, physical and farcical variety, is one of the most difficult and disciplined of theatre forms to pull off convincingly and satisfyingly. Too broad and the lampooning leads to audience disconnect, too specific or regimented and it feels stilted, insincere and, well, staged. To marry the natural buoyancy and vim of comedy with the precision and practice of physical slapstick and farce in particular is so tricky a balancing act that rarely does it work as successfully in theatre as it would in other mediums such as film or television, which allow themselves the luxury and safety net of cutaways, close-ups and the edit to mask the joins. 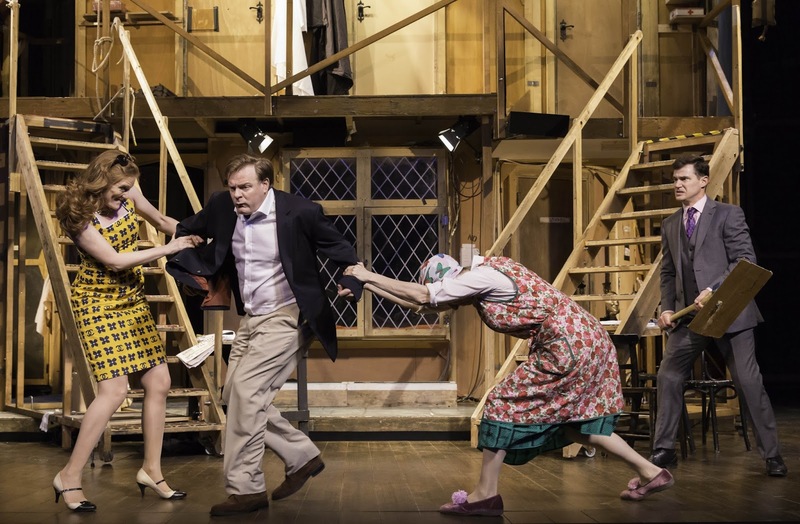 When and where it does work, however, results in the kind of energised, barnstorming frenzy of farcical funny and theatrical hijinks that is Noises Off. 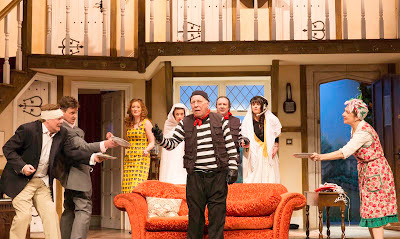 One of the most celebrated and successful slices of British theatre comedy of all time, Noises Off belies its 31 years of age thanks mostly to Michael Frayn’s wonderfully inventive writing and structuring, which have been repeatedly tweaked and re-written over the course of the past three decades, and in this current UK tour thanks in no small part to an incredibly game company who give uniformly terrific, charged and spirited performances. 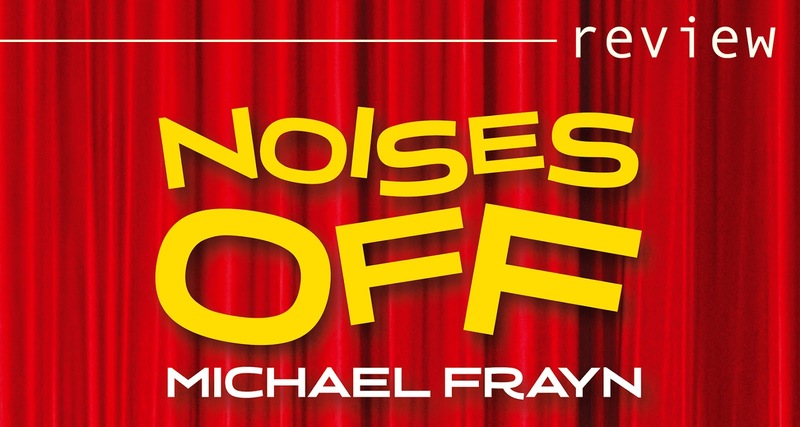 Depicting the trials and tribulations of a small theatre troupe attempting to put on a particularly groansome farce - play-within-a-play ‘Nothing On’ - Noise’s Off’s relatively unique three-act structure takes a look at the show at three separate intervals - from a desperate attempt at a final dress (tech?) rehearsal, to a behind-the-scenes update midway through the plays tour and finally a disastrous last-leg attempt to cross the finish line as the fallout and failures pile up and the metaphorical wheels on the wagon well and truly come flying off in a hilarious fashion. 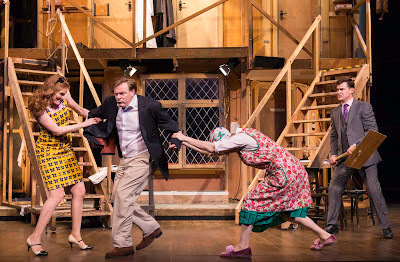 As the relationships and dynamics between the cast and stage talent deteriorate and misunderstandings and miscommunication beget mayhem, so do does the show itself begin to accelerate into a wonderfully inventive comedic frenzy. It’s a brilliantly judged escalation of event and humour, with the first act, introducing us rather measuredly to the general structure and players for ‘Nothing On’ , being merely a mildly amusing initiation in readiness for the madness that will follow in Act 2 with the beats and key moments of the fictional play behind the basis of much of the gags. The notion of a play-within-a-play was not overly original even back in 1982 when Noises Off debuted, but it’s difficult to think of a show which more gamely sends up the concept whilst being surprisingly imaginative, postmodern and creative in doing so. The aforementioned first act sees Neil Pearson’s jaded director Lloyd literally directing the show as a rehearsal from out in the stalls, whereas upon a return from the interval we are greeted with a complete stage reversal, this time bearing witness to an almost Chaplin-esque farce of mimery and action behind the scenes as the play unfolds, liberally sprinkled with duelling castmates, a menagerie of props being misplaced or abused and a supremely well executed swathe of physical slapstick. Finally, the show once again wheels around for its ‘third’ act and re-establishes us as ‘Nothing On’s final ever audience as the hilarity and ridiculousness of the mishaps and mistakes reach their apex, with some of the cast hysterically attempting to improvise with the increasingly impossible madness around them as others succumb to the mayhem and freewheel into absurdity. Enormous credit must go, as mentioned, to the wonderful company assembled for this current UK tour. 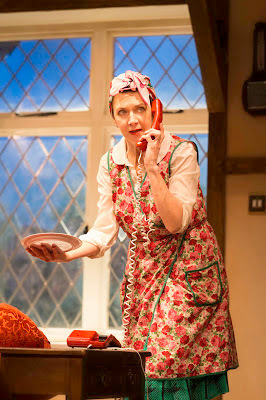 Maureen Beattie is suitably barmy as the shows veteran actress, the aptly named ‘Dotty’, who finds herself embroiled in an increasingly problematic love triangle, Neil Pearson brings a wonderful sardonic flippancy to director Lloyd, and Chris Larkin is delightfully melodramatic and effeminate as typical luvvie Frederick who, bless him, erupts into nosebleeds at the sight of anything resembling violence, and is self-admittedly not very good with, well, seemingly anything. Two of the real standouts, however, have to be David Bark-Jones, who gives great stage presence and comic precision as increasingly erratic thesp Garry, from smug, charming yet somewhat inarticulate ponce through to an all-out enraged physical pincushion of sorts as the show progresses, and Sasha Waddell as irrepressibly upbeat actress Belinda, whose hilarious and hysterical attempts to improvise, keep the show on track and maintain group cohesion as eveything goes to hell around her offers echoes of Patricia Routledge and other similarly wonderfully gifted comediennes. It’s a terrific ensemble who all help sell the insanity masterfully, and each member of the cast should be commended for mastering what is doubtless an extremely technical, rigorous and disciplined show to execute so faultlessly. 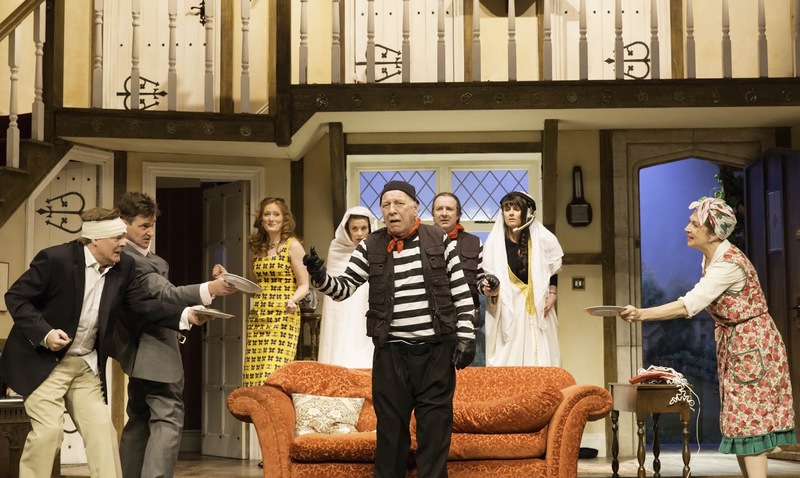 For as with Ms. Parton, who does indeed no doubt spend an exorbitant amount of money to look so ‘cheap’, so too does it deceptively take such a tremendous amount of work, craft and talent to make something appear to go so spectacularly, and indeed hilariously, wrong as it does in Noises Off. NOISES OFF is running at the New Alexandra Theatre, Birmingham from Monday 24 to Saturday 29 June 2013. Press tickets for this performance of Noises Off were provided courtesy of The New Alexandra Theatre, Birmingham directly. (A)musings Media gratefully acknowledges their generous invitation.